It was high time for an encounter between the most universal of foods and the most diverse drink in the world. Maybe the simple hamburger did not fancy rubbing shoulders with the sophisticated wine. Or it was perhaps difficult to imagine the fast food icon sharing a table with the most gourmet drinkable icon. 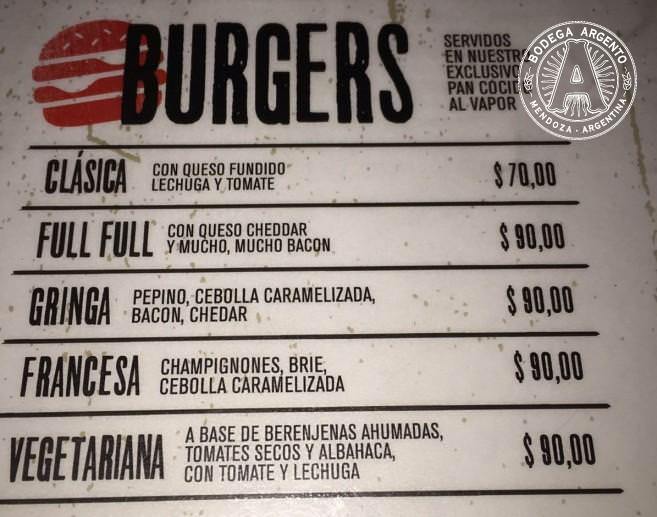 The fact is that today wine and hamburger meet face to face in Buenos Aires. The former at its peak, with increasingly demanding consumers that force wineries to multiply, while also upgrading, their label portfolio. That is why there are more and more wineries and wine bars throughout the country, and particularly in Buenos Aires. Hamburgers, in turn, became trendy along with the proliferation of innovative and gourmet proposals. In the intent to quit the “fast” domain and detach from the fast food cliché, local cooks had to engage all of their creativity to win over the most discerning palates. It all began with a group of young cooks who developed a new concept that soon proved to meet current demands. Bars and restaurants are plentiful in Argentina, but fine and top-notch eating requires increasingly more money. Diners, however, are not daunted by this fact, but rather induced to shrink their dishes. Consequently, the average spending in restaurants is gradually dropping. People still choose to eat out as one of their main entertainments, but they spend increasingly less money. This conditioning situation also derived in an inclination to share the main dish, skip the entrée, or the dessert. 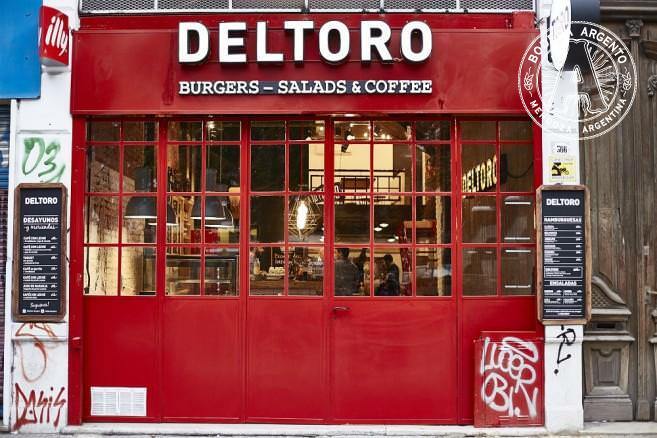 In this context, an interesting alternative has popped-up, which is both attractive and efficient: the burger-bar movement. What is so special about these burgers to make us think of a more elaborate drink to pair with them? That is what many a person is asking. To start with, quality and processing methods. 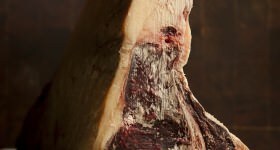 They are usually homemade, using first-quality meat and handcraft processing. The varieties go from 100% veal to combinations with pork, lamb and even chicken. Griddle and grill cleanliness is also essential, as well as keeping them vacuum sealed until just before cooking. The special touch is in the add-ons served with the meat. First, the bread, homemade and of different types, followed by the vegetables, always fresh. The view is nearly as important as taste, so nothing is left to chance here. Cheese is no longer the sliced type, but rather nearly shares the leading role with meat. That is why Cheddar, Brie and Blue cheese have become so popular. As to cold cuts, bacon has definitely overthrown boiled ham. A cook’s art comes into full view in the combinations. There is already a long list of burgers that we could consider classics. However, innovation is the norm in many of these redoubts. The places are always relaxed, some of them neater, others more rustic, but all sharing the same purpose: being a space where people of all ages can come and seat to enjoy a savory burger. Who can hold back from it? An attractive, tasty, consistent, practical, diverse and, above all, affordable meal. That’s what makes it, here and now, the most widely preferred proposal. 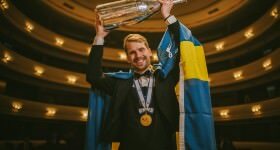 It is true, though, that such a bustling and noisy environment can be an enemy of wine, which usually requires wineglasses and a more relaxed atmosphere. But this time, wine is not meant to be the main character, but rather a good companion for the burger, to enhance the whole experience. Fortunately, there is a great deal of wines that can be fully enjoyed in this environment, particularly young wines with a rather straightforward character, preferably varietals, as they show their true self, whether in ordinary or wine glasses (some places do not offer the latter). Malbec certainly heads the list, with its powerful appeal from the very first glass, its freshness, fruitiness and gentle tannins. But it is not alone –Bonarda, Cabernet Franc and even Cabernet Sauvignon adapt very well to different burgers. Some of them go even better with whites like Chardonnay or Pinot Grigio; and sometimes a rosé or a sparkling can win the game. It all depends on what is in between the two pieces of bread, how risky the combination of flavors and textures is and the desire to fully enjoy such a popular meal. Let’s start by the classic one, with cheese, tomato and lettuce, as served almost everywhere, including Burger Joint, one of the pioneers. Cheese is of the essence here, whether melted like a Cheddar, or a soft and creamy Emmenthal, more of a cooler option. This burger asks for a classic red wine, but one with a grip, one of austere scents and taste, such as a young Cabernet Sauvignon, which is usually vibrant and moderate in character, going from black fruits to spices with a herbal aftertaste, but soft in intensity. And its tannins, always incipient, are ideal to cleanse the palate while awaiting the next bite. 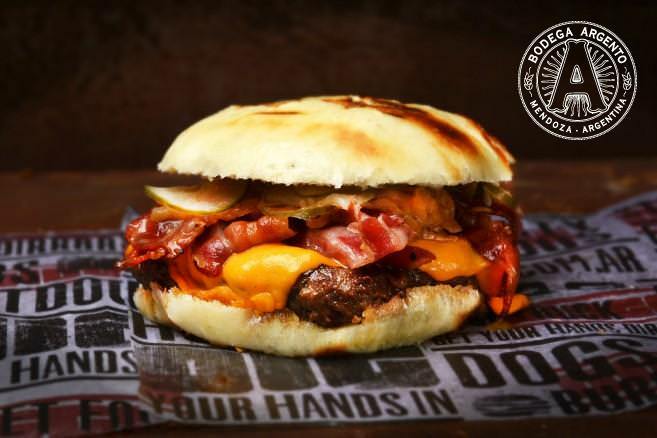 In Diggs, you will find the Full Full, which comes with Cheddar cheese and lots of bacon, in an interesting combination of textures and flavors. Here, you need to provide some graceful freshness, as toasted bacon is normally quite salty and makes your mouth dry. So, the best option will be a good Malbec; young, fleshy and with its own well-defined character of red fruits and spices. Ideally, drink it rather cool, no worries, its tannins are always docile and cooling will not toughen them. Dante Franco, Diggs’ cook and owner, says his burgers are 100% export quality veal and grill-cooked. Another distinctive feature is that bread is steam-baked and then only slightly grilled, which results in a super spongy texture. Their “Gringa” burger, served with Cheddar cheese, bacon, caramelized onions and gherkins, also goes very well with Malbec, with a slight woody touch in this case. 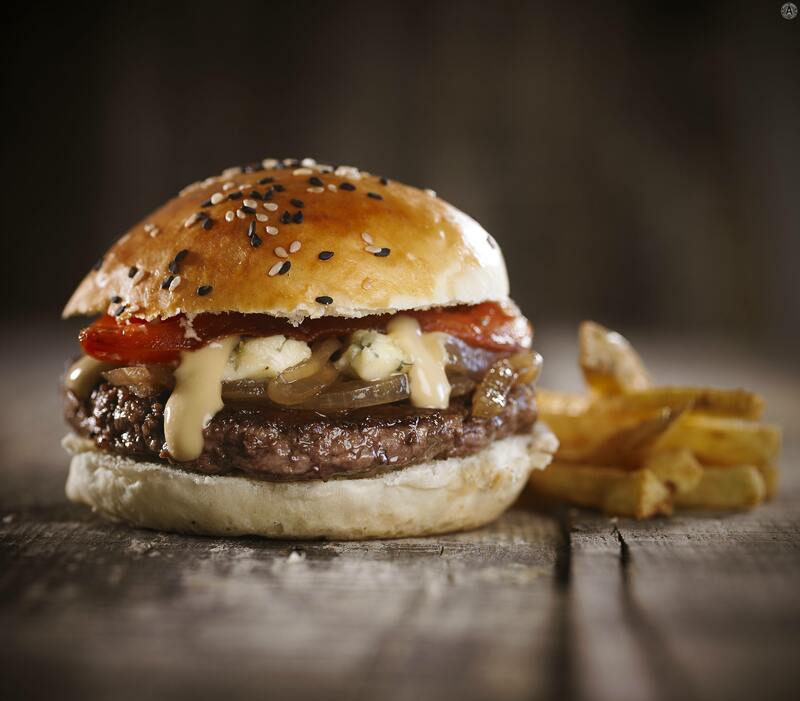 There is a burger often associated with France on account of its accompanying ingredients: champignons, Brie cheese and caramelized onions. Certainly, a gourmet combination in fast food format, thus requiring a definitely gastronomic wine. A red with full body but not weight, easily flowing in the mouth to wash away such combination of flavors, yet overshadowing none. The right choice here is a Cabernet Franc, Young but balanced, with a typical herbal finish to refresh the mouth. There are all types of veggie burgers, but they all coincide in adding an original touch to the main ingredient; for instance, smoked eggplant, dried tomatoes, or those wholly made of chickpeas. In this case, the pairing wine has to be mainly refreshing, yet not invasive. That is why Chardonnay is the best option, as it fills the mouth with its voluptuousness while accentuating the nuances of the vegetables in their diverse preparations and seasonings. 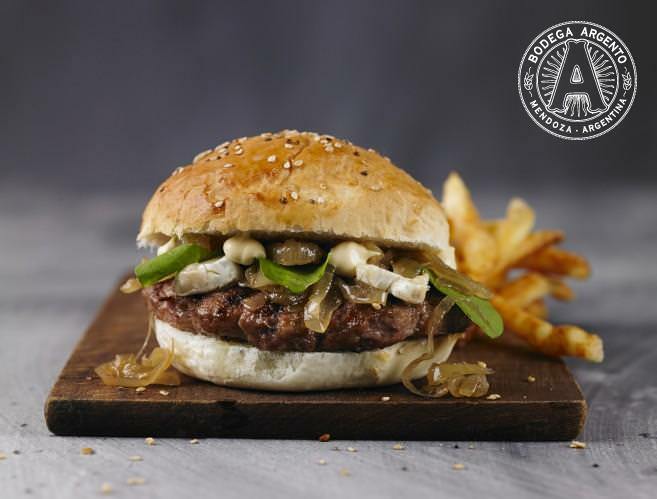 Breoghan Brewery Pub is the place to find constant innovation in gourmet burgers, but one of them is there to stay: the lamb burger, served with beer-hydrated dried tomatoes, red onion rings, khira raita sauce (very refreshing, with cucumbers), arugula and olive oil. Here, the diversity of ingredients produces a real revolution of tastes in the mouth. Anyway, the basic one is a strong and firm meat, which calls for a rosé wine. Its freshness, firm acidity and tight body succeed in achieving a graceful harmony. 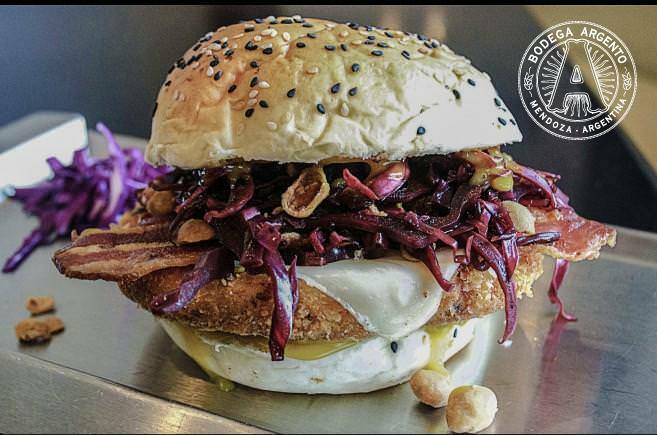 Another place that stands out for its innovative proposal between breads is Mi Barrio (my neighborhood), with their brand new “Saavedra” –homemade chicken burger, crispy-breaded and combined with mozzarella cheese, crunchy bacon, sautéed red cabbage, a sprinkle of cracked Japanese peanuts and honey mustard, affording balance and personality. Here we need a wine of character but not weighty, which makes Pinot Grigio a very good alternative. Because it is mostly a fresh and agile white, but unctuous as well. It is rather austere as to scent and taste, and will therefore exalt the complexity of every bite in the mouth. The Burger Company, the brand-new luxury burger restaurant in Palermo, caters a salmon burger served with Brie cheese that also pairs very well with either Pinot Grigio or Chardonnay. Spanish chef Yago Márquez presents an explosive proposal at Del Toro. This is an attractive option for Mexican flavors’ fans, named Azteca burger. Made of pork meat and served with guacamole, nachos and lettuce in freshly-baked bread. And though many will think of a beer here, the fact is a sparkling will suit it better. This is because the combination of pork meat with avocado’s texture is usually dense and persistent, and a sparkling wine is the only one capable of preparing the palate for the upcoming bite. With its freshness and bubbles, it cleanses and renews the mouth, not even presuming of its flavors. Of course, you can also enjoy gourmet burgers in bars and restaurants. 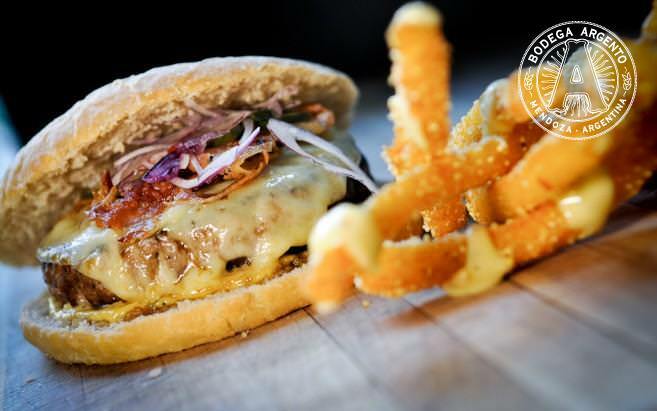 As a matter of fact, Bar 878’s lamb-based burger is among the most famous ones, a status also shared by UCO’s –the restaurant at Fierro Hotel– special 75%-veal burger (secret cut kept under lock and key by the cook) and 25% bacon, smoked at UCO with quebracho wood. It is served medium-done, with provoleta cheese, bacon and pickles, dressed with homemade chimichurri-based sauce, and sided by fried polenta sticks. Bonarda, a generous red with character and good presence in the mouth, is the right choice to pair with either proposal. 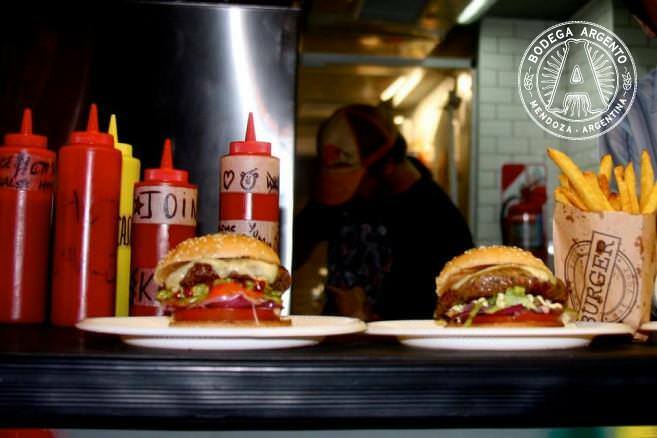 There are lots of other places in Buenos Aires where you can get to know and enjoy an original and delicious burger. If the burger is paired with wine, the experience will certainly prove much more interesting and take on a new dimension. You just have to make up your mind and let yourself go.